This chap has been featured on this blog before. 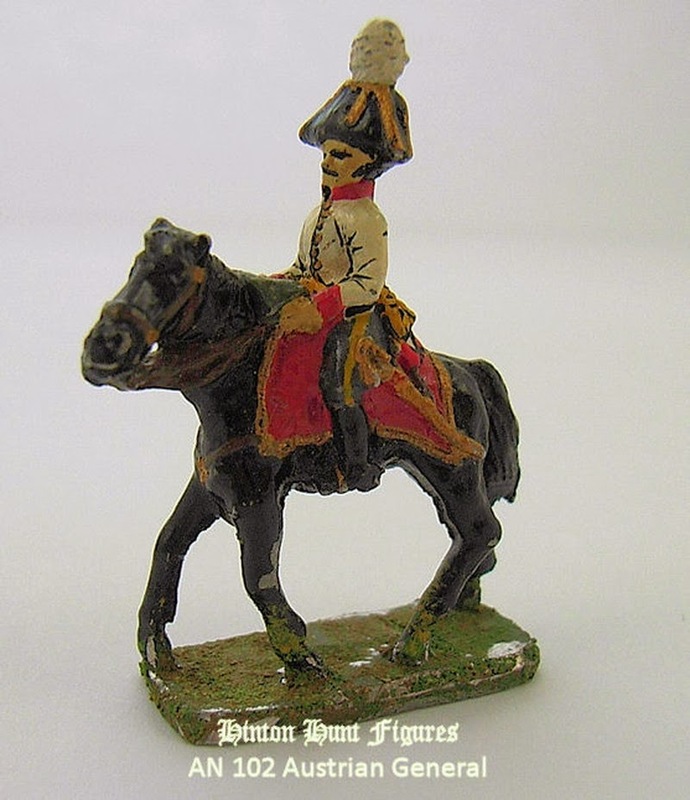 I bought him, a good while ago, as part of a job lot on eBay - he was sold as a mounted British infantry officer - apparently an old Hinton Hunt OPC, and I put him away in the spares box for a future refurb. It seems a pity to waste a useful figure, and his Austrian origins, and consequent lack of epaulettes, suggested a possible conversion to a Spanish general officer. As is the way of these things, the headless horseman has been kicking around my painting desk for three years now, but I am trying to move my Spanish army towards some kind of complete state, and I am always short of generals and staff officers - in particular, I need brigadiers - quite a few of them - and since there are precious few suitable castings around it becomes a very attractive idea to produce some conversions. Not many things look as limp as a complete set of identical officers - a matching battalion is OK - I have plenty of those - but matching officers are not so cool. 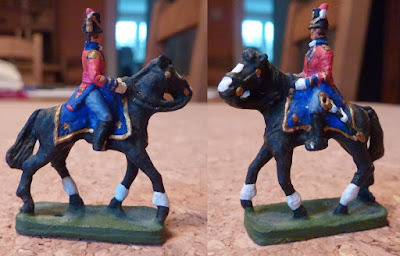 Righto then - there was a pequeño uniform for Spanish generals - single breasted, like a French surtout, and I gave my adventurer a head from a miscast Spanish fusilero from my NapoleoN spares, who had a missing foot. Better and better - nothing goes to waste here, if I can avoid it. As always, he will win no prizes for beauty, but he is a unique figure, and I need all the characters I can get for my Spanish army. By the way, you will observe that the base of the original figure has been built up with lead sheet, which is a bit serious for my collection - if anyone recognises this fellow - in any of his past personae, please do get in touch! An excellent use of classic Hinton Hunt figure. I recently renovated one myself. You did an excellent job on it - very nice. I have some of those with the thick base serving as Swedish generals in my own armies but they're not as pretty as yours! Nice work. Hinton never did do a British, or other mounted colonel...a great pity as it results in battalions commanded by gaudy marshals and British Generals. The NapoleoN head goes on well, I would have thought it might be a bit bigger , but it looks great and with rather more expression than many HH heads! I second Mr L Gunner's comment...nice work. That is a crackingly good conversion, Foy! I also have a mysterious British mounted officer, but not nearly as nice as yours. I think he may be an Alberken casting. I've yet to decide what to do with him. BNC5 is a listed Minifigs 20mm Inf colonel - I've never seen an original, but there are a lot of very lumpy copies and copies of copies in circulation - carve your own figure! He's so thickly coated in paint that it's hard to tell whether he's an original or not at the moment. The metal seems good, however. That new head suits him, I like the slight turn to the right, adds character. Thank you all gentlemen - these days I take a lot of trouble over head grafts - a little brass wire as a dowel joint, careful matching of faces and superglue accelerator. This one also took a little Vallejo acrylic putty to smooth off his collar. I must add a note to my catalogue of where he came from - otherwise this Spanish brigadier may one day wonder why his horse is called Schnüβchen. Great work - he looks suitably insouciant! Exactly the word I was searching for. Thank you, young sir. A nice job you have done there and I do like the idea of "unique" figures. 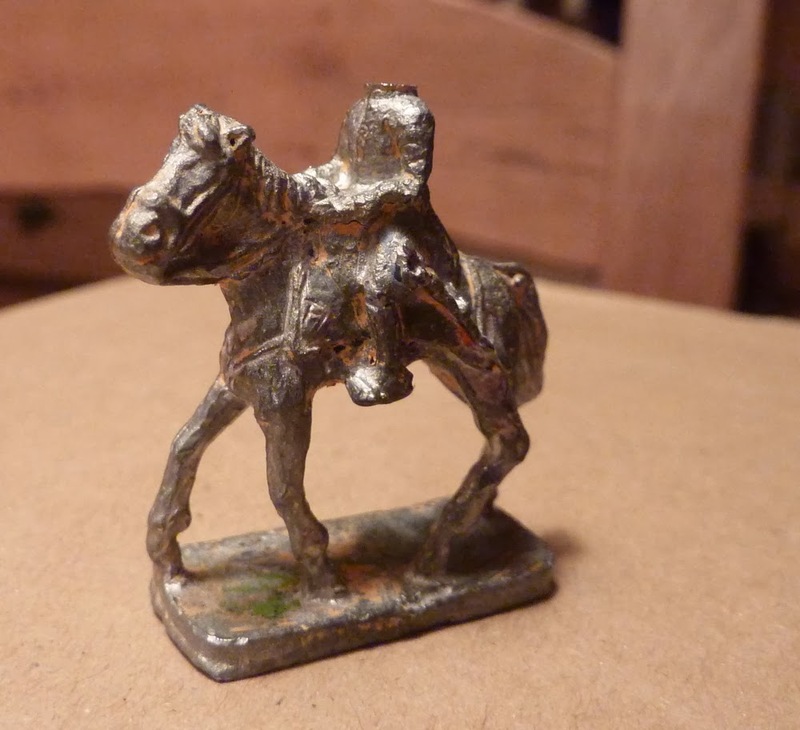 Martin S emailed to point out that the photo of the Austrian general I borrowed from the Hinton Hunter blog also seems to have the base built up with lead sheet. Erm - now that is getting a bit spooky. You don't suppose...? No - course not - I guess it's simply that it was common good practice among wargamers circa 1968 to give general officers some extra weight to stop them falling over on the tabletop. Interesting, though?